Perfect for hands-on learning and illustrative teaching of area, volume, surface area-nets, symmetry and perimeter. This 16-piece set includes 8 transparent shapes and 8 folding shapes. Each shape is in both fold-out net form (showing 2 dimensions) and clear plastic casing, showing 3 dimensions. 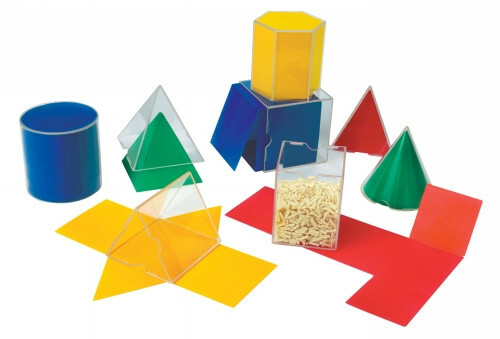 Includes cylinder, square pyramid, cube, rectangular prism, cone, hexagonal prism, triangular prism and triangular pyramid. Shapes are 75mm high. Set of 16.